By choosing Add / Edit station you will see the dialog for setting up a new station, or changing the selected station. name : Fill in the name of your station. Always start by giving the new station a name, otherwise it will not be saved. In this case we will name it Studio 1 and alter the settings. SC-RTP: send and receive a symmetric RTP stream with integrated signalling. Send the same stream on all available active network-interfaces. So when you have a 3G and a WIFI connection, LUCI will send 2 streams. This way, if 1 connection breaks up, the studio will still receive the other. For Android this only works with a special networking combining app like Speedify. RTP Multicast Source: LUCI can be a source for multiple Multicast listeners. RTP Multicast Receiver: LUCI can be set as a Multicast listener. 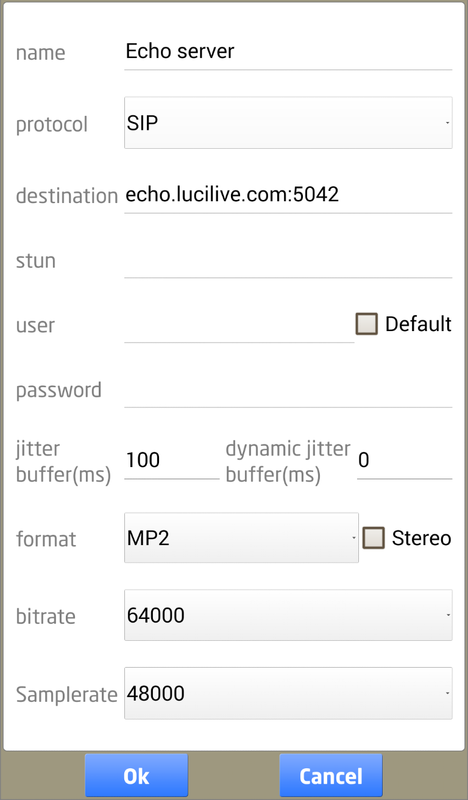 Shoutcast: LUCI can be a source for a Shoutcast internet radio station you operate. 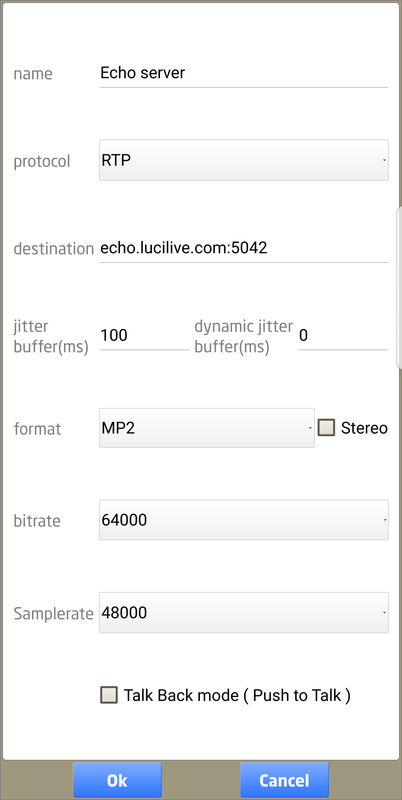 Icecast: LUCI can be a source for an Icecast internet radio station you operate. destination : The connection details of the server/studio codec. Use CODEC@SIPSERVER or CODEC (when there is no SIPserver) where SIPSERVER is the URL or IP-address of the SIPserver. or sourceIP,multicastIP:port for Source Specific Multicast , example: 192.168.1.10,224.10.10.10:7001. Use an IP-address or URL. stun : Only valid for the SIP protocol, when needed. user : Your username is the name you use to login at your server. Only fill in username if you want to log in to a SIP, Shoutcast or Icecast server. password : Your password is your personal log on credential belonging to your username. Passwords are used only together with usernames for logging in to SIP, Shoutcast or Icecast servers. jitter buffer : Default value 100 ms (WiFi) / 200 ms (3G). Supported buffer length WiFi and 3G: 10 ms to 500 ms. This is the jitter buffer that LUCI uses for the RETURN stream. This will NOT have any influence on the outgoing stream to the studio. jitter buffer Dyn. : This is a setting that you can choose so the software determines the buffer that is needed to get a drop free connection automatically while you are streaming. It takes the normal jitter buffer setting ( say 50 ms ) as the lowest possible, and the Jitter Buffer Dyn. setting ( say 200 ms ) as the possible range ( so buffer automatically set is between 50 and 250 msec ). 0 ms will set this feature off. stereo : Default is Mono. Select Stereo if you want to broadcast in Stereo, and the chosen codec ( ‘Stations > New station > Streaming’) supports it. bitrate : Default value is set on 64 kbps. Set the bitrate of the codec format you select. Supported bitrates depend on the chosen codec. Samplerate : Default value 48KHz. Set Sample-rate of the codec format you selected for the outgoing stream. Talk Back mode ( Push to Talk ) : Kind of Walkie-Talkie mode to be able to only listen, and only talkback by pressing a button. Similar to a Talk button on a studio mixing console. For live studio music mix / voice-over producers reviews or other applications were you do not want to use headphones.